The following comments about attractions in Honolulu have been posted from individuals. We believe that the best reviews of Honolulu, Hawaii (HI), HI USA are written by travelers and holiday makers who have experienced Honolulu first hand and want to share their thoughts. Can you share yours? Please help us expand this section of our Honolulu World Guide. Let us know what you think about the attractions in Honolulu, Hawaii (HI) USA. Submit comments about Honolulu attractions here. Waikiki is a tropical paradise and had everything I could have wished for. The views were endless, the hotel was great, the surf was great and the people were friendly. At times the beaches were a little busy, but we always managed to find a nice spot to soak up the sunshine. Plenty of nice places to eat all over the place, although I would think that the food in most hotels is more than adequate for most. I rented a car for just a day and decided to explore more of the island of Oahu - and what a good idea that turned out to be! Renting the car cost us less than $30 and allowed up to visited the north shore, and it was so easy. The roads were simple to follow and the scenery was just incredible. For me it was the best part of the holiday and a good way to find some really good attractions that weren't quite so mainstream. Well worth it, at least for a day. We were approached a number of times by people on the streets on Honolulu trying to sell us tickets for evening cruises and i must admit that I was a little dubious at first. However, a friend to us that this was just a way to try and fill up the boats at the last minute, so we decided to give it a go and booked up for a dinner cruise that even. What a good idea that turned out to be - the sunset was gorgeous, the buffet was great and consisted of lots of fresh seafood, and we were even picked up from the hotel by a bus. It wasn't at all expensive and much better than I expected it would be. I was very glad we did this. 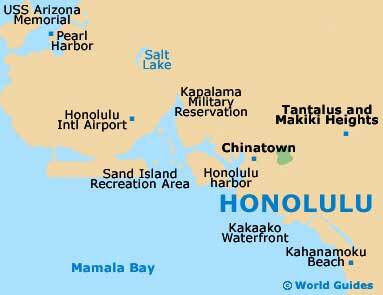 Please note that these Honolulu, Hawaii (HI), HI USA comments and reviews are posted by individuals and are not necessarily the views of World Guides.